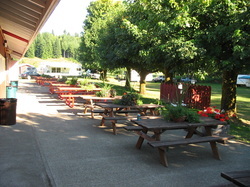 The Lewis-Pacific Swiss Society recreational area is located in Pacific County on 10 acres in the scenic Willapa Hills bordered by the Willapa River in Frances, WA. The site includes an RV campground with 80 hook-ups and dump station facilities are available. Our spacious grounds provide a special play area for children and outside restroom facilities. There is also a 50' x 50' covered picnic area for rainy days and numerous other picnic areas. Two regulation size horseshoe pits are also located on the grounds. Log Beer Garden with center fire place. The main Swiss Hall features a 40' x 60' dance floor with a stage for musicians. There is also a dining area with full view of the dance floor and stage. There are full kitchen facilities that include a grill and serving counters. The spacious lounge area features a bar with taps for keg beer and a walk-in cooler. 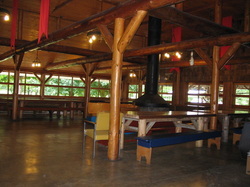 A prominant feature of the Swiss Hall is a rustic log structured Beer Garden complete with wood stove and fireplace. There are tables and room for dining in the Beer Garden. The hall and grounds are also available to rent for weddings, birthdays, anniversaries, family picnics, or any other gatherings. Rental options are listed below. Reservations will be assigned based on application date and at the discretion of the LPSS Board. For further information and to make a reservation, please call 360-934-6496. Grounds are included in the “Entire Hall Rental” option. If you chose any of the other rental options and would like to use the grounds, you will need to pay the “Grounds” rental fee as well. RV hookups are not included with your rental. Any hookups used and not paid for will be deducted from your deposit.